The way I figure it, everyone gets a miracle. Like, I will probably never be struck by lightning, or win a Nobel Prize, or become the dictator of a small nation in the Pacific Islands, or contract terminal ear cancer, or spontaneaously combust. Quentin has been in love with Margo Roth Spiegelmann for a long time. She is a popular girl, full of crazy ideas and pranks. One night she climbs through his window and takes him on an adventure through town. When she disappears the next day, leaving behind only some clues, Quentin decides to follow them and find Margo. I really like John Green’s writing. It’s just so fluid and easy to read. Before you know it you’ve read 100 pages. 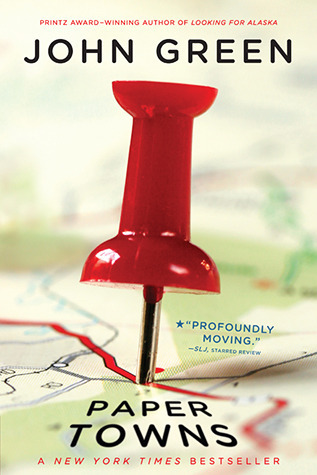 This is the third novel by John Green that I’ve read and the characters are starting to blur together. Margo and Quentin, and even the secondary characters reminded me so much of his other novels. There was just not enough to distinguish them. Except for the names, they could have been the same. They had the same reactions, their speech patterns were similar, they just seemed like copies. Despite reminding me so much of other characters, I did not like Quentin and Margo. They are both incredibly selfish and Q was so pretentious it was annoying and I found myself rolling my eyes frequently. What played into that, as well, was the whole thing with Walter Whitman. Song of Myself is used throughout the book as a sort of guide for Q and his search, for him trying to understand Margo and for him growing up. However, it didn’t fit organically with the rest of the story. It read like a paper on Whitman was inserted into the novel. After all that hearing, he writes, “I am exposed …. cut by bitter and poisoned hail.” That was perfect, I thought: you listen to people so that you can imagine them, and you hear all the terrible and wonderful things people do to themselves and one another, but in the end the listening exposes you even more than it exposes the people you’re trying to listen to. These parts threw me out of the story and only enhanced the feeling of Quentin’s pretentiousness. Margo, on the other hand was just too manic for my taste. She had too much nervous energy. When she wasn’t being manic, she also felt pretentious. You see how fake it all is. It’s not even hard enough to be made out of plastic. It’s a paper town. I mean look at it, Q: look at all those cul-de-sacs, those streets that turn in on themselves, all the houses that were built to fall apart. All those paper people living in their paper houses, burning the future to stay warm. Furthermore, Q really started to annoy me with his obsession with Margo. It was slightly creepy. It was annoying. I wanted to slap him. And this is what I was trying to do, too, I guess: to listen to all the little sounds of her, because before any of it could make sense, it had to be heard. For so long, I hadn’t really heard Margo – I’d seen her screaming and thought her laughing – that now I figured it was my job. To try, even at this great remove, to hear the opera of her. He is constantly angry with his friends for enjoying normal things, for thinking about something else than Margo. For caring about prom and having fun instead of helping him in his obsessive search for Margo. His friends were really saints for putting up with him. I understood Radar was trying to make me laugh, but I only wanted to talk about one thing. Margo Roth Spiegelmann was a person, too. And I had never quite thought of her that way, not really; it was a failure of all my previous imaginings. Margo was not a miracle. She was not an adventure. She was not a fine and precious thing. She was a girl. However, despite acknowledging that, nothing really changes. Quentin is still obsessed by her. Despite finally realizing he idolized her, made her into something otherworldy, he continues to do it. Margo is objectified throughout by Quentin, not allowing her to be a normal person but his idea of her. The language flows and that makes Paper Towns really easy to read. However, I did not like the characters. They felt too similar to his other works and were way too obsessive and pretentious for me to really enjoy reading about them.